JUST ARRIVED. $175K NEW! LOWEST PRICED SV AUTOBIOGRAPHY DYNAMIC IN THE COUNTRY. STILL UNDER FACTORY WARRANTY. CORRIS GREY OVER BLACK AND RED DIAMOND STITCHED LEATHER. 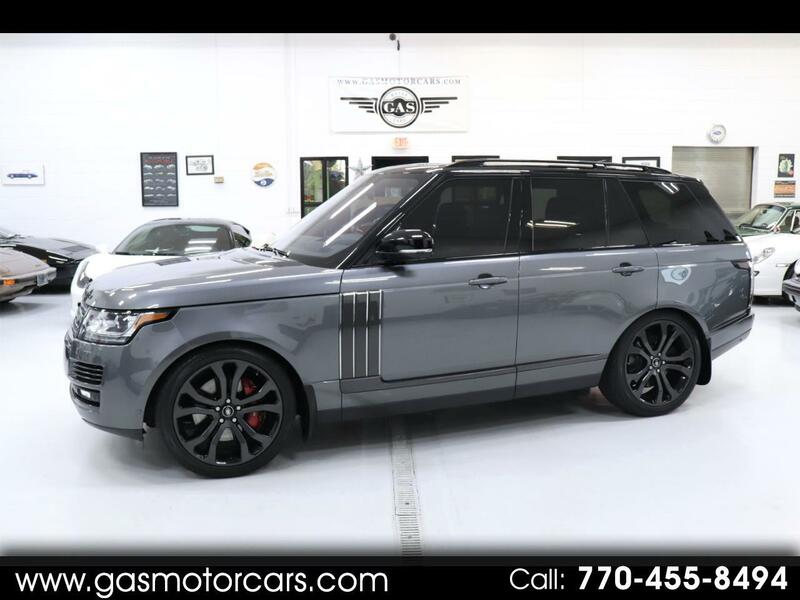 22 INCH DARK GRAY FINISH WHEELS, BLACK ROOF, 1600 WATT MERIDIAN AUDIO SYSTEM, 575 HP SUPERCHARGED V8, AND MUCH MUCH MORE. THE SV AUTOBIOGRAPHY IS THE MOST EXPENSIVE ROVER PRODUCED. EVERY SINGLE EXPOSED INTERIOR PANEL IS COVERED IN HAND STITCHED LEATHER AND SUEDE. THE PERFORMANCE IS ON PAR WITH SOME OF THE WORLDS FASTEST SUPERCARS AND THE SOUNDS IT MAKES ARE INTOXICATING, THIS ROVER IS TREMENDOUS VALUE. GAS MOTORCARS INC IS A FAMILY OWNED AND OPERATED DEALERSHIP LOCATED IN MARIETTA, GA. WE ONLY SELL VEHICLES OF THE HIGHEST QUALITY. WE CAN EXPORT. WE CAN SHIP ANYWHERE IN THE WORLD AT THE BUYERS EXPENSE. WE SHOW VEHICLES BY APPOINTMENT ONLY. WE CAN TAKE TRADES. Message: Thought you might be interested in this 2017 Land Rover Range Rover.